Not so long ago, Samsung Turkey revealed that the official update to Android Oreo for Samsung phones will start in early 2018. Our hunch was that the tech giant, like last year, will open a Galaxy Beta program for the likes of Samsung Galaxy S8 and S8+ before making the OS official for everyone beginning early next year. Well, it turns out this might materialize. According to a tipster who is privy to what happens at Samsung, Ice Universe, the tech giant is set to open the Galaxy Beta program for Samsung Galaxy S8 and S8+ users in the U.S. starting next week Tuesday the 31st. As expected, this will bring the new Android Oreo to the two phones, however, there’s nowhere the Galaxy Note 8 appears. As it is, this program will be open on Samsung Members and Samsung+, but it will be limited to only 7500 spots for each device. As long as you are using an unlocked model of the Galaxy S8 or S8+, you can join the beta program. Also, those on T-Mobile and Sprint will be eligible to take part in the Galaxy Beta program. 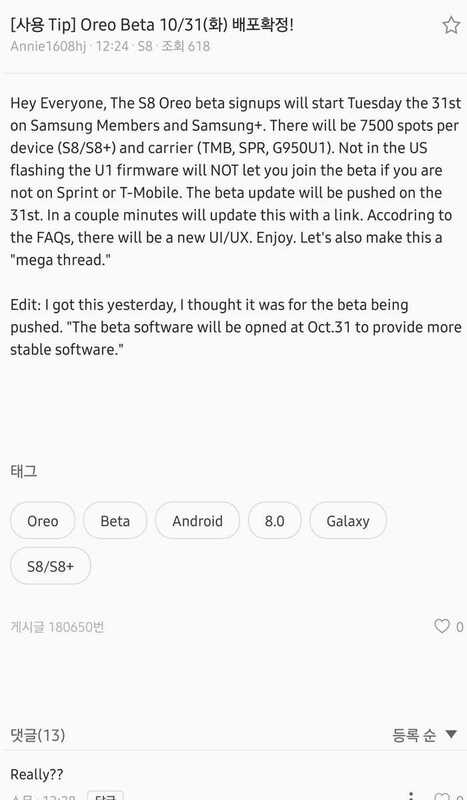 Note that if you are not in the U.S., flashing the firmware for the unlocked model won’t get you into Android Oreo beta program.